Bell tent hire for private parties, company days, hen parties and more! We hire for all kinds of events, our most popular are hen parties, birthday gatherings and increasingly small or private festivals. Having pre-pitched accommodation saves on time and transporting lots of luggage, so it’s easy to see why it’s so popular. We work with several venues in Dorset and south Hampshire and can suggest potential venues if you haven’t yet chosen one. We found working with New Forest Bell Tents easy for our festival PhoneyFEST. The tents were great and they are already booked for next year! Over the past few years we’re proud to have provided overnight accommodation for many company days and company sponsored festivals for employees. 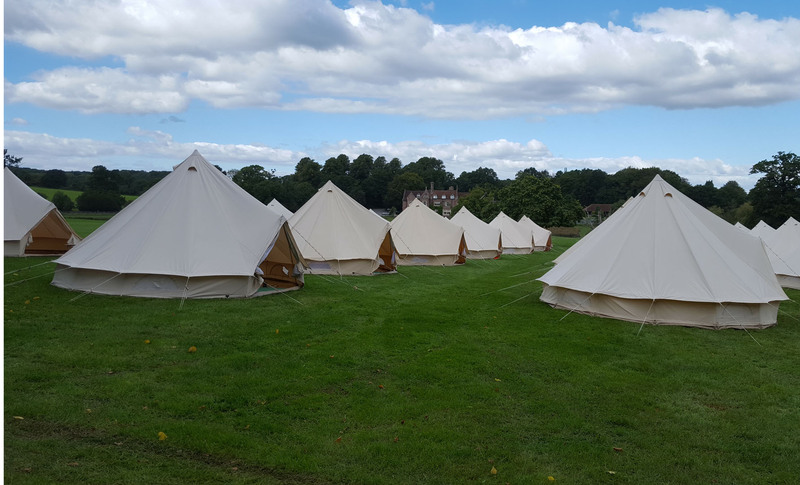 Currently we can accommodate a maximum of 150 people in our bell tents and can also work in partnership with other bell tent/marquee companies for even bigger bookings. 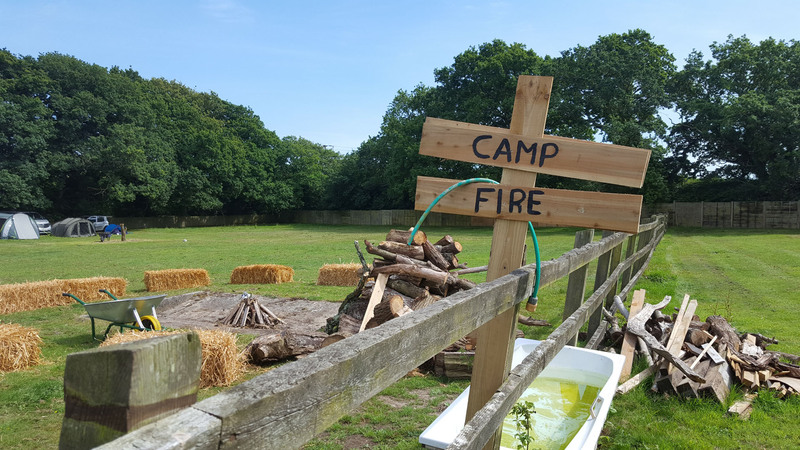 We have links with several activity providers in both the New Forest and Dorset, who can provide everything from bushcraft, coasteering, surfing/SUP, kayaking and other watersports to archery and team building activities. To find out more, get in touch and we’ll be happy to advise. 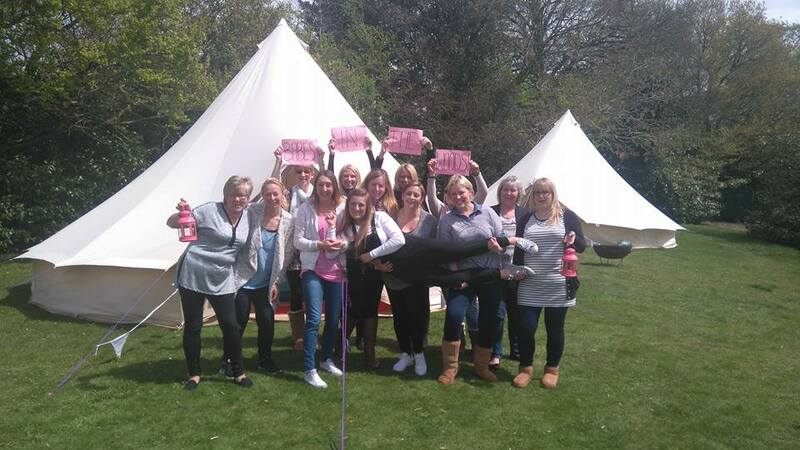 Glamping get togethers are the perfect way to celebrate a Hen Party. What goes on in the tent stays in the tent!!! Our large 7m bell tents are our most popular option for hen parties, accommodating 9 per tent. We can erect a bell tent on private land and also work with several campsites that allow hen groups in designated areas of their sites. Whether you choose to have a cosy get together or go off and do an activity, one or two of our large bell tents means you can all be together. We’ll be happy to add extra touches inside like extra bunting or fairy lights wrapped around the centre pole. If you need something tailor made for your event we’ll do our best to help. Examples of bespoke tents are – chill-out area, ‘glam’ getting ready tent, children’s creche/play tent, themed tents. 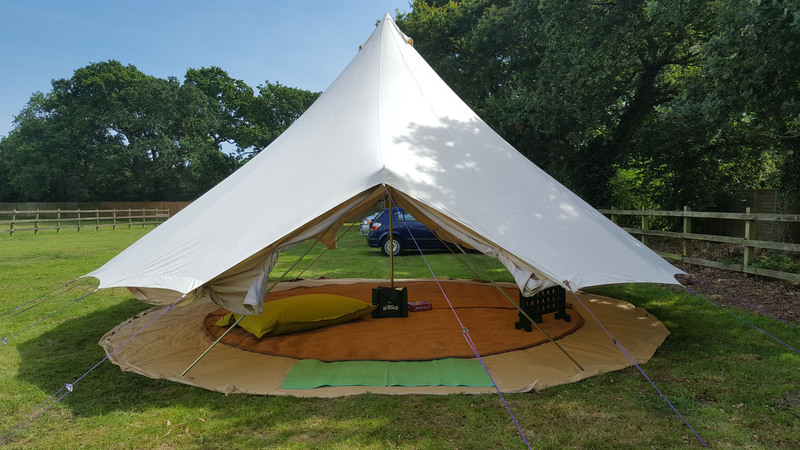 As we hire a large volume of tents our packages are standardised, but if you need something in particular we have extra resources and furnishings available to customise our bell tents. The bell tent pictured here is one of our 7m bell tents, used here as a kids/games tent with the sides rolled-up for a private festival. For large events we can offer a bulk discount on orders of 10+ bell tents, which is usually 20% off our standard prices. Bespoke tents £POA. Our 7m furnished bell tents are £350 for weekend hire (minimum hire charge applies for one night hire). Get in touch with us with your requirements and to check availability. Once we’ve confirmed costs and availability, just fill in the online booking form on our booking page to complete your booking.